Buy burmese brown mountain tortoise and burmese black mountain tortoise for sale online. The Burmese Mountain Tortoise is generally considered the fourth largest land tortoise in the world. It is second in size only to Geochelone sulcata (African Spurred Tortoise) among the mainland tortoises, reaching maximum weights of close to 100 lbs. The phayerei subspecies is generally considered to be the larger, with emys emys usually only reaching ½ the size of their relatives. The emys subspecies is also called the Burmese Brown Tortoise while the phayerei is called the Black. Both have also been called the six-footed (legged) tortoise due to the very large and pointed tubercular scales on the rear thighs. 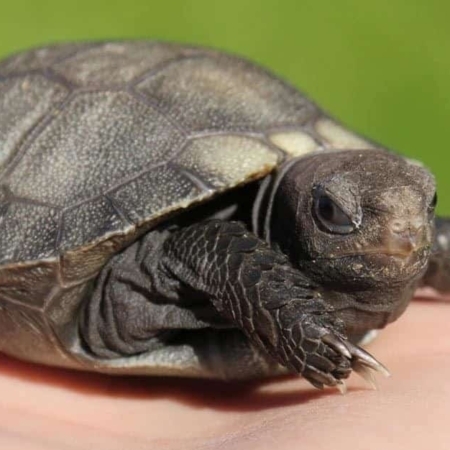 When looking for a baby burmese mountain tortoise for sale, consider if you are looking for a burmese brown tortoise or burmese black tortoise. In the wild, Burms are found in Assam, Myanmar (Burma), Thailand, the Malay Peninsula, Sumatra and Borneo. They prefer moderate (as opposed to desert) temperatures of 55F to 85F and relatively high humidity between 60% to 100%. Yearlings should not be allowed to reach temps below 65F or so. Despite the high humidity requirement, airflow is a requirement so a closed or stagnant air cage is not recommended. Hiding spots are preferred, as are rains or mists which will usually stimulate a feeding response. Burms are crepuscular, usually active in the morning and evening, but can be found basking or wandering about during a cool day. Diet is very widely varied, consisting of minimal grasses but lots of clover, plantain, dandelions and other broadleaf weeds. Vegetables, including greens, cactus, cauliflower, yams and squashes are preferred, but fruits and worms are also readily consumed. Protein intake is higher than most grazing herbivores such as Geochelone pardalis (Leopard Tortoises) or G. sulcata, but this is to be expected given the availability of invertebrates and carrion in their natural environment. Calcium can be sprinkled on all foods. It is suggested that one use calcium supplemented with vitamin D3 if the animal is being maintained indoors and calcium without D3 if it is outdoors. Youngsters are often very shy, emerging from hiding only to eat, but as they grow (and they grow very quickly) larger specimens show a great deal of curiosity and will often approach to see what you are doing in their yard.